My sense is that she’s seen scant use over the last 57 years. But time does take its toll on fasteners and finishes. We have released the keel, splash and rub rails bow eye and transom eyes. As of late yesterday, RJ and I have stripped her to bare wood below the waterline. What we found there is a literal sea of failed fasteners, both silicon bronze screws and smooth shank nails. Very few are broken. However, most are standing proud of the surface as they are just no longer biting, or are completely loose. What surprised us is that Cruisers specified 6 x ¾” wood screws, even though the plywood sheathing is a full half-inch thick. Since none of the countersinks is more than a sixteenth inch” deep, at best the last quarter inch of each screw was sunk into the ribs. It’s little wonder that they have lost their bite and backed out over the decades. We will release and replace every screw and nail with 8 x 1” or 8 x 1-1/4” wood screw, which also means driving toothpicks and Gorilla glue into every screw and nail hole. 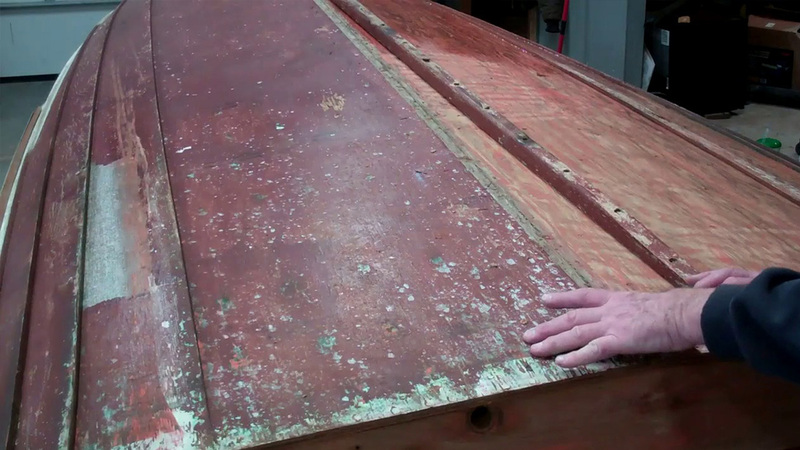 For now the project involves reaching for gallons of Circa 1850 Heavy Bodied Paint and Varnish Remover, our Sandvik scrapers and our stainless pot scrubbers. Way too much fun for one and all to be sure!